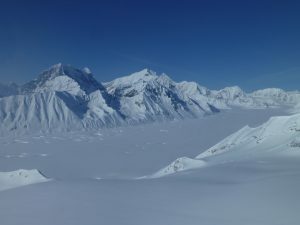 Ice sheets, mountain glaciers, ice caps and other perennial ice masses form an important part of the hydrological cycle, and have a major influence on global sea level. The impact of variations in melt-water discharge from mountain glaciers affects down-stream domestic water supply, irrigation, and hydro power production. In the arid high mountain ranges of central Asia, glacier runoff can be the sole source of water for communities, which are particularly vulnerable to impacts from retreating glaciers. The Division on Glaciers and Ice sheets aims to further the scientific objectives of the Association through co-ordination of scientific research, organisation of scientific meetings, and promotion of the exchange of information and data in the field of ice sheet and glacier research. This includes a focus on measurements and modelling to better constrain the past, present and future sea level contribution from the large ice sheets in Greenland and Antarctica, and from ice caps and glaciers peripheral to the ice sheets, and in other parts of the world. Glaciological field and satellite measurements of glacier fluctuations and mass change are systematically collected and archived by the World Glacier Monitoring Service (WGMS), National Snow and Ice Data Center (NSIDC) and Global Land Ice Measurement from Space (GLIMS) project. These efforts are coordinated via the overarching Global Terrestrial Network for Glaciers (GTN-G) which is advised by a Standing Group chaired (ex-officio) by the head of this IACS Division. Currently relevant research topics for this Division include new techniques of glaciological field and satellite observations, such as gravity variations due to ice mass changes, glacier and ice sheet mapping from space, determination of surface melt extent from optical and micro wave sensors, the use of automatic weather stations for remote meteorological measurements, and ice velocity measurement from InSAR. There is also a focus on basic ice dynamic processes which are not fully understood at the level required to accurately predict the response of ice sheets and mountain glaciers to climate change. Physical processes of relevance include measurement and modeling of iceberg calving, basal conditions, ice stream and ice shelf dynamics, surge behavior and ice sheet-ocean interactions.